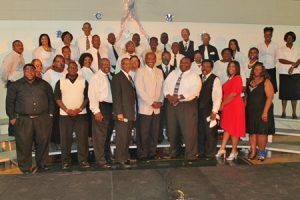 The singing of praise and singing of the gospel were resounding at the Strom Thurmond High School gym on Saturday, July 20. The Edgefield County Mass Choir put on an outstanding performance. They sang gospel songs such as “Stand By Me,” “Rise Above It All,” and “Tell Me Who Built the Arc.” One of the oldest members of the choir named Mrs. Bessie Tucker was a very special guest and she sang “Come On In This House, It’s Going to Rain”. The Mass Choir consists of twenty-five members and it is of diverse ages. After the performance, I asked Tamera Clark who is a young member of the choir what is the best part of being a member and she replied, “Having the opportunity to sing with older people which allows my voice to mature and being welcomed by the Christian spirit”. Mr. James Bibbs is the organizer of the committee and there are eleven other committee members. When Mr. James Bibbs retired from the military, he felt that the community was divided. He knew that there was no other way to bring the community back together than to sing God’s word. A community that prays together, stays together. The program was opened up with prayer by Reverend Johnny Clark who is the pastor of Macedonia Baptist Church. The State Representative of District 82, William Clyburn, was present as the guest speaker.